Recent court decisions affirm that federal agencies can’t deny protections to our nation’s waters without scientific support or input from the public. When the Clean Water Act was passed in 1972, Republican Senator Howard Baker from Tennessee declared in a statement that the law was “far and away the most significant and promising piece of environmental legislation ever enacted by the Congress.” Spurred by rampant pollution of the country’s waters and a searing image of the Cuyahoga River on fire in Cleveland, the bipartisan legislation had the sweeping goal of restoring and maintaining “the Nation’s waters.” Now, our nation’s waters are very much at risk again as the Trump administration attempts to roll back the scope of the Clean Water Act and limit which waters it protects. Our streams, rivers, and lakes are under constant threat from toxic pollutants from industries; runoff from urban and suburban streets and large agricultural operations; the loss of wetlands from heavy development in coastal areas and agriculture; and increases in severe weather and natural disasters related to climate change. These waterways in our communities provide sources of drinking water, as well as recreational areas and wildlife habitat. In some ways, the Clean Water Act is a raging success, evidenced in part by the significant time and money polluters have spent on the years-long effort to weaken the law. However, over 40 years after the Clean Water Act’s passage, more than half of our streams and rivers remain in poor condition, unfit for swimming, drinking, or fishing. We cannot afford to let our waters slide backwards and become dirtier. Yet, the Trump administration has proposed to repeal a rule that strengthened water protections by using sound science to identify the waters covered by the Clean Water Act — the Clean Water Rule. EPA and the Army Corps developed the Clean Water Rule after a series of Supreme Court decisions over the last few decades had left the agencies and the public with mixed messages about how to determine whether a waterbody should get the protections of the Clean Water Act. The act applies broadly to all “waters of the United States,” but the agencies had been applying that term inconsistently and often to the detriment of the waters in question due to the confusion left by the Supreme Court. After four years of extensive scientific study and analysis, the agencies published clarified definitions of “waters of the United States” in the Clean Water Rule in 2015. Following the advice of elementary school teachers everywhere, the agencies not only announced their decisions but also showed their work, carefully explaining why the policy choices were supported by science and publishing a weighty scientific report that reviewed more than 1,200 peer-reviewed publications on water connectivity. The agencies also submitted their proposal to multiple rounds of scientific review by experts in fields ranging from biology to hydrology to geology. This report and the expert reviews of it reaffirmed what we already knew to be true and what any person can readily observe: that all waters flow downstream, from small creeks and wetlands to our major rivers and lakes. In order to protect the waters of the United States as directed by Congress, all waters must receive the protections of the Clean Water Act. Shortly after finalization of the Clean Water Rule, multiple legal cases were filed in federal district courts around the country. The cases were initially grouped together to be heard jointly by the Sixth Circuit Court of Appeals, but then the Supreme Court weighed in and kicked the cases back down to the federal district courts. Currently, there are cases in at least half a dozen federal district courts around the country concerning various challenges related to the Clean Water Rule and/or the Trump administration’s attempts to get rid of it. After the Trump administration took office, the agencies embarked on a rushed mission to eliminate the Clean Water Rule, without bothering to follow the steps required by law. The twists and turns in the agencies’ illegal dance are dizzying. First, in March of 2017, the agencies announced their future intent to “review and rescind or revise” the Clean Water Rule. Then, in June of 2017, without any valid scientific or legal support, the Agencies proposed to wholesale repeal the Clean Water Rule. The agencies also began discussing a replacement rule that would be far less protective of waters, but no replacement has been proposed as of the date of this posting. About a year after the proposed repeal, the agencies published a “supplemental” proposed repeal in another flawed attempt to repeal the Clean Water Rule. In between these two publications, in November of 2017, the agencies attempted a different strategy and proposed to instead keep the Clean Water Rule on the books, but add a new “applicability date” to the rule of two years in the future, in order to effectively repeal the rule by making it inapplicable for two years. This two-year delay proposal was also without scientific or legal support, but the agencies nonetheless hurried through a short 21-day public comment period during which they refused to consider or accept public comments on the extensive scientific record that supported the Clean Water Rule or any of the water policy implications of rendering the rule inapplicable for two years. The agencies quickly finalized the “applicability date” rule in February of 2018. Fortunately, this period of “inapplicability” for the Clean Water Rule was short-lived, as this unlawful attempt to buy time has now twice been struck down by federal courts in two different jurisdictions. On behalf of our clients Idaho Conservation League, Puget Soundkeeper Alliance, and Sierra Club, we challenged the applicability date rule in the U.S. District Court for the Western District of Washington. On November 26, 2018, that court ruled in favor of our challenge and decided that the Trump administration’s attempt to delay the Clean Water Rule for two years without a complete and full public comment opportunity was unlawful. 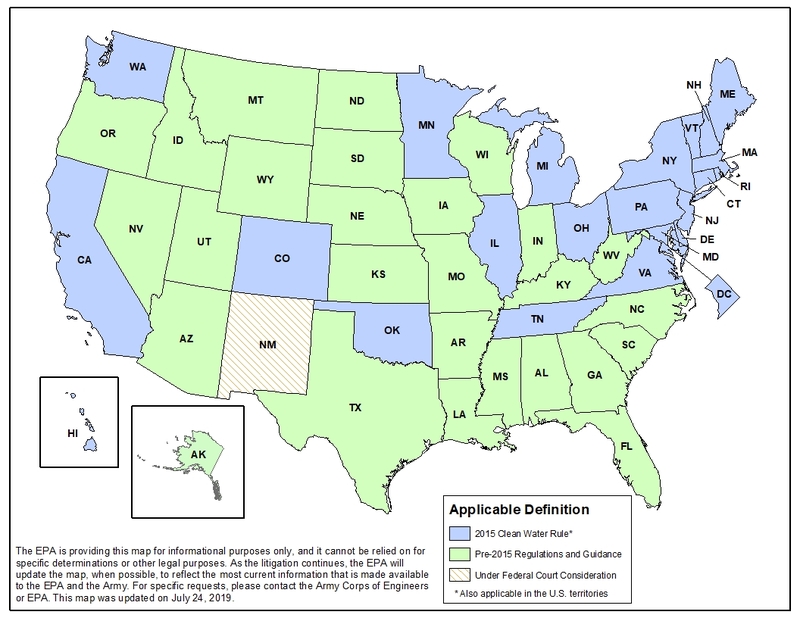 As a result, the applicability date rule has been “vacated” nationwide, which means the rule is completely overturned and the agencies have to go back to the drawing board. Because a federal district court in South Carolina reached a similar decision in August of this year, the Washington court’s decision does not affect which rule applies on the ground, but instead adds strength and clarity to the legal landscape. The South Carolina court’s August decision reinstated the Clean Water Rule in the twenty-two states where it is not under a separate court injunction, and it remains in effect in those states today, providing protections to waterways using science-based definitions to determine which waters are protected by the Clean Water Act. The decisions by the South Carolina and Western District of Washington district courts reaffirmed that the agencies can’t simply ignore the data and deny protections to our nation’s waters without scientific support and without input from the public. The work to protect our “waters of the United States” continues, as we defend the Clean Water Rule in courts in North Dakota and Oklahoma. And when the Trump administration announces its next steps in its quest to repeal the Clean Water Rule and replace it with a far weaker rule, Earthjustice will continue to fight for the full protection of our nation’s waters, as Congress intended.